Home » do-it-yourself » BiCi Co is Growing! Looking for a Great Bike Mechanic & Awesome Person to Join the Team! 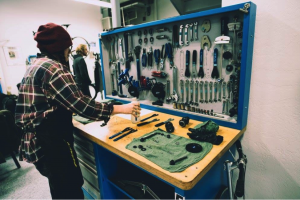 Are you a great bike mechanic with a passion for community and desire to push beyond the confines of the traditional bike shop? Know someone that knows bikes, loves serving the community and working with kids. We’re a dream opportunity! BiCi Co. is a unique and exciting opportunity to develop a bike shop from the ground up. The shop will be an integral element and catalyst of the Hartford bike scene. We’re building a movement to shift Hartford car culture. Our goal is to become the leading bike shop in Hartford that blends a social mission with business savvy. We are seeking a team member that takes initiative, diagnoses and solve issues, and give clients and customers a helpful and meaningful experience. Does that sound like a mission you can stand behind? This might just be the place for you! To Apply: Cover letter and resume required. Please send cover letter and resume to Bici_Co@ctprf.org. No phone inquiries, please.